What a great start to our new term! We had an Easter bonnet parade and the children loved showing their creations off in our parade. All the names of the children were put into our Easter bucket and four winners were pulled out to receive an Easter egg. But our other friends didn’t miss out and we had some mini chocolate eggs which were yummy. It was a lovely end to our Easter celebrations. 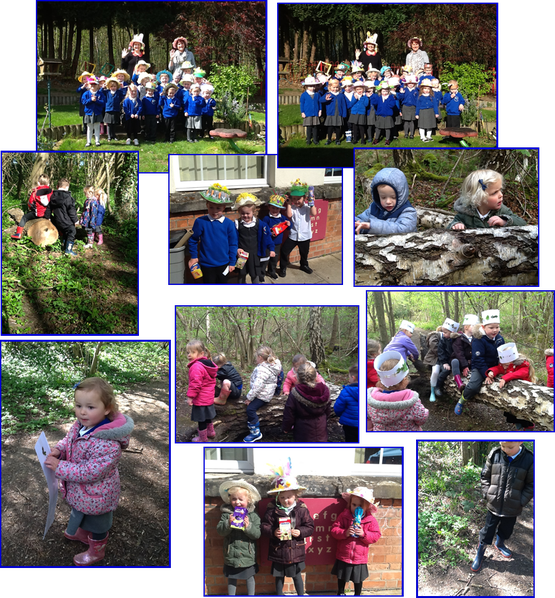 The children were amazing in the woods, on Treemendous Tuesday, and so full of energy! I think they had really missed our adventures; it was all so exciting and much easier to house our wellies in our new wellie house. We climbed onto the fallen log and now every single one of our friends is able to find a way to get onto it. Some like to go higher and move themselves along the log, although Poppy didn’t like the bumpiness! Our littler friends tackled the smaller end, but I know before long, they will be challenging themselves to go higher! The morning children explored the woods and looked at all the new flowers that had grown since the last time we were here. The afternoon children made pictures on the floor with anything they could find in the woods. Zach made a mouse, Jayden made his daddy and Avah-Mae made a flower. Then they made a crown and decorated it with anything they could find on the floor of the woods to make it pretty. Our morning friends will be doing this next week. They all ran under a tree and our new starter Evie shouted, ‘I’m the king!’ It’s like she has been here forever! What a great day and we can’t wait until next week!